Farmers Field Schools (FFS) employ participatory learning processes to enhance capacities of rural communities to improve food production and livelihoods, tailored to local needs. FFS were initiated in Asia over 20 years ago in the context of FAO and Government led efforts on Integrated Pest Management (IPM). Since then they have spread across the globe and evolved, with support from different actors, well beyond IPM to become a widely used approach to education, community development and capacity building. There is an increasing interest and demand for FFS by governments and civil society, academia and donors, as a means to enhance capacities for sustainable food production, by building resilience and empowering vulnerable communities to cope with emerging challenges such as climate change. In response to this demand, FAO led a Global FFS Review process, which involved 15 countries in experience sharing through national workshops; and two rounds of virtual discussions on FFS and quality FFS programming. Building on the Global FFS Review, and in the context of the Strategic Objective 2, a process is now being promoted to support the development of quality FFS programs at the regional and sub-regional levels. For an example see the box below. The sub-regional workshop, organized in partnership with the FAO Sub-Regional Office for Southern Africa and FAO Representation in Zambia, will provide an opportunity to build the capacity of participants on FFS principles; map on-going FFS activities/programs in the sub region; develop a road map for further development of FFS; establish a network of FFS experts and practitioners and link with experts/networks in other regions; identify gaps/needs for specific training. Based on the outcome of this workshop, similar workshops may be conducted and FFS networks established in other sub-regions. 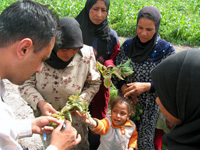 The Government of Jordan provides full support to FFSs as they are considered an important approach promoted by the Extension Service of the National Center for Agricultural Research and Extension (NCARE).